Finishing Friday morning at 09:19. Riding the prologue Monday morning with a couple thousand other randonneurs…the skies looked ominous but it stayed pretty dry. After the last few weeks of riding in the intense heat during Raid Pyreneen I was almost looking forward to some rain! I met and rode with Han from Audux Australia and enjoyed his stories and plans for cycle touring after PBP. It was great to see all the SIR contingent out! The great group of riders who all shared the Le Relais de Voisins for the week -what a fun group! Met new friends and got reacquainted with Peter Norris from FL…”do you have any blue Loc-Tite? ?” Jim Kern and I took and nice spin about town and succeeded in getting lost and found a few times in St. Quentin…we had a beer in the Diaganol and then headed downstairs with our bikes to the mega-store for some shopping and soy milk. The store was beyond huge!! Riding into Villaines La Juhel with Frenchman John who lives in Aix-en-Provence and having a great conversation about family and life, though we each spoke little of the others language (but he was much better than I!) Bill joined us and we all had a good time through the rolling hills and sunshine. Meeting Riv-riding Larry from Berkley (?) early Thursday morning and taking each other’s pictures next to a huge wine bottle on the way to Fougeres. Riding at break-neck speed through the night between Loudeac and Tinteniac with Cindy and George on the tandem with Kevin the Central CA RBA and Tina Hoeben and Sarah Tennant from BC Randonneurs. We were on the return leg and enjoyed a very long break at the secret control where I consumed a very large coffee with cocoa mixed in. We listened to a fellow playing the accordian who also hit on Tina…she finally escaped so our ride could continue. It was cold out and we got a little too comfortable! Meeting Tom the American banker who lives in London and riding to Loudeac on Tuesday evening. I met his father and two friends and we had dinner together. 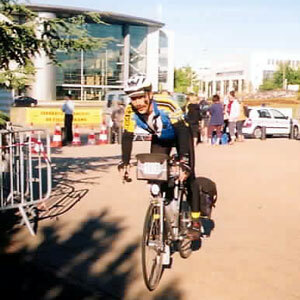 He put the idea to ride onto Carhaix-Plouguer for the first stop (which I did), but never saw him after we ate -Bummer! Riding with Jim Sprague and chatting while we meandered through the night. I would run into other SIR folks along the way and it was nice swapping stories and sharing in this special experience. The older French rider from the Gorron Club who paced me into town. I couldn’t quite keep up with him! Stopped in La Tanniere for crepes and coffeee at a family roadside stand. Met up with Craig from the Davis club who seemed to pop up just about everywhere during the whole event. The town of Sizun seemed more beautiful than most. Every town though had a gorgeous church and the obligatory cruxifiction mounted somewhere and I had many a thought about religion and faith along the way (and during the previous Raid). I could hear roosters every morning and church bells peeling during the day. Meeting Jack Eason at the start and holding each other’s bikes while we attended to the call of nature waiting for our wave to head out. Sad to hear he feel asleep on the bike and crashed out. Seeing the ocean coming into Brest and then the big cable bridge. The climb back out was beautiful! Stopping for a juice, biscuit, chocolate and a sugar cube from a roadside stand run by two little girls. High-fiving all the kids along the way. Hearing “bon courage” from windows in houses along the route. Falling aslseep on the bike and nearly crashing into a ditch, woke up just in time to swerve back onto the road. Same night I saw a very tired English rider and pulled out my Normandie chocolate chip cookies to help him stay awake. Slept on the side of the road one night at 39 degrees F and woke up 12 minutes later so stiff I could hardly move. I could’ve waited because within one km was a family with their garage open who had coffee, snacks and warm blankets…what a treat! Bill sharing his last glass of red wine and a Paris-Brest pastry with me in Nogent Le Roi at 3 a.m. on the last night. There were alot of sleepy folks there and I got a nice hour rest before heading out at 5:00 a.m. The stream of lights as we left St. Quentin en Yvenlines and the cheering crowd on the return Friday morning. Even though I didn’t make it in under 80 hours, I didn’t really care. This was just plain fun and I was sorry to see it end so soon. Meeting up with Paul Baccho on August 24th and heading to Charles de Gaulle to fly home…he has ridden PBP 5 times(!) and I really enjoyed talking to him while we rode the bus and waited for our flight. He loaned me $20 so I could eat at the airport…and that’s just what one sandwich and a beer cost! He was a great conversationalist and helped me put all my feelings of PBP into a unique light and inspired me to keep this tradition. I’ll see him in 2007 for #6! Lessons learned: Try not to jump into speeding pacelines in the first 24 hours…get some Pepcid for stomach reflux issues. Go lighter, one wool jersey and one poly, one less pair of socks, less tools and tubes. Need larger shoes with metatarsal bumps. Get S&S couplings to save money on domestic flying ($80-90 each way)! I know I could get into the mid-70 hour range with just a bit more planning…but this ride is just too much fun!